Jairzinho was a worthy successor to Garrincha and his devastating bursts of speed combined with lethal shooting were one of the highlights of the great 1970 World Cup. Born Jair Ventura Filho in 1944, he began on the left wing and at centre-forward with Botafogo and gained his chance on the right when Garrincha was injured. His international debut was against Portugal in the 1964 "Little World Cup" and two years later he appeared in the big World Cup in England. With Garrincha recalled, though, Jairzinho switched to the left flank and was not as effective. Brazil bowed out already in the first round. In 1970, however, after recovering from a twice-broken right leg, he became the only player to score in every round including the final. His seven goals were second only to Gerd Müller's ten and Jairzinho's came in many forms - delicate chips and powerful shooting. His winner against England was one of the tournament's most memorable goals, but he was also a goalmaker and split defences with superb passing. 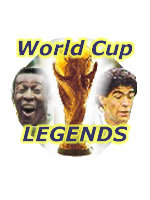 He appeared in the 1974 World Cup too, but without players like Pelè in support he was not as effective. He later played for Olympique Marseille, but soon returned to Rio. 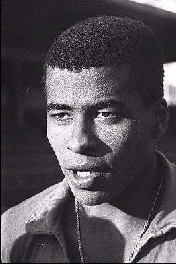 Jairzinho won more than 80 caps, the last when he was in his 38th year.